I spent Halloween weekend in New York this year, and it gave me a chance to reflect on my former beau. As some of you know, I lived in Manhattan from 1998 to 2000. I was poor, but I felt like I was at the center of the universe. Any New Yorker knows what I mean. Below is a shot of me on Stanton Street on the Lower East Side (LES), just a few blocks from (one of the places) where I used to live. Despite the swanky boutiques and hip restaurants that have opened all around my old abode, I am proud to report that my rickety LES loft building remains the not-up-to-code eviction palace of a decade ago. The door is still covered with graffiti. There is still no buzzer system. The tattered “Fabrics” sign still points to the time when it was a textile factory. In fact, the only difference I could see is that the pay phone outside the door, which my friends would have to use to call up to me (because no one had cell phones yet! ), has been yanked out. Having visited about once a year since I left, I usually feel pangs of joy...followed by stinging rebuffs. This was a pang of joy. Another was Halloween evening, where literally 98% of the people we passed on the streets were in costume. No city does Halloween as unanimously or passionately. The atmosphere was magical. Plus, where else can you go to a random party populated by professional trapeze artists? Here are two of the most agile ones making everyone else look out-of-shape on the dance floor. But before long, the rejection and disorientation began. It’s almost like the city is the kind of lover that strives to erase all memory of you once you’ve gone. How? By changing just about everything you adored – including your favorite restaurants, storefronts and bars. They’ll just disappear. So, to try to stay fresh, you make new discoveries on your trip, but a year later, you can’t even count on those. It can be demoralizing. Here’s the perfect example. On Saturday night of Halloween weekend, we were meeting up with several friends for dinner. I suggested Bao 111 in the East Village and pulled up the restaurant’s website to show my boyfriend. He gave it a thumbs up, so we called to make a reservation for eight people. No problem, they said. But when we arrived at 111 Avenue C, the sign said Arcane, not Bao 111. Flustered, I thought, this can’t be right. I must have the address wrong. But I didn’t. It was just New York letting me know once again that once you’re out, you’re out. As it turns out, Bao 111 had closed a month earlier, and the new restaurant simply took over the phone number. After getting over my mortification, I just followed the current New Yorkers’ lead and rolled with it. 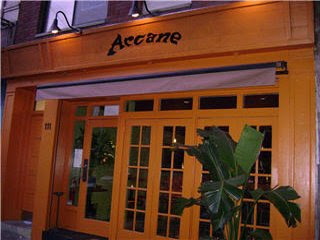 Fortunately, Arcane ended up being a great find, and the ebullient French-Caribbean owners were eager to please. My lime chicken was fantastic, and the evening turned out just fine. The moral of this story? Once you leave New York, it moves on, whether you like it or not. You can no longer be an expert on the city even a few months later. So this time, I officially let it go. From now on, it’ll just be a familiar stranger who I run into and experience anew. The good thing is that I know I can’t fall for it again. Too expensive, too crowded, too many people. When you’re in a great mood, you love all eight million of them. But when you’re in a bad mood, you’re ready to commit homicide if someone bumps you. That’s not right for me anymore. I want a place with fewer bumps and more room to breathe. And it looks like 2009 is going to be when I finally decide on where that is. Huzzah!